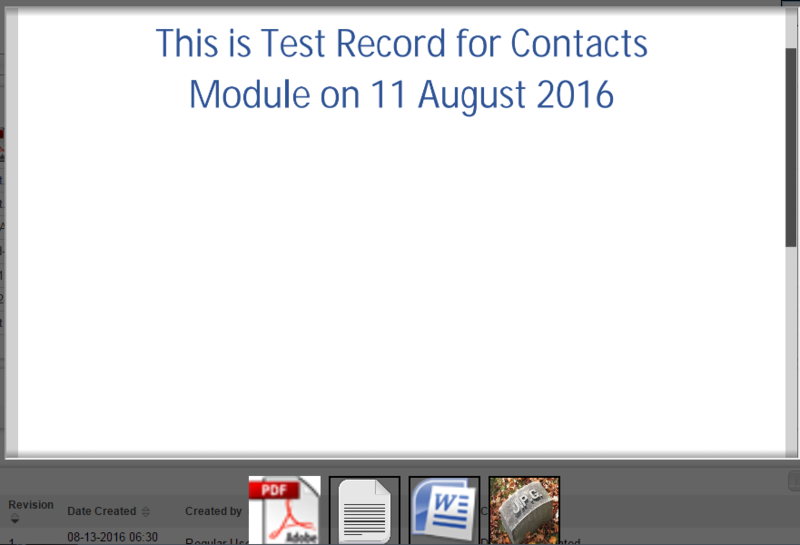 By default, CRM does not have the facility to upload multiple documents or images. Only one file type data type exists which allows uploading single file. Difficult to rename documents/images etc but they should be human and SEO friendly. No preview facility. By default, CRM does not have the facility to preview the documents uploaded. Hence Ideadunes team came up with the facility to upload multiple documents and images with preview facility. The files that you upload will be clearly visible in the various views such as Edit View, Detail View, Sub Panel (Quick Create), List View, Dashboard. With this add-on it makes it simple to both upload and manages your various file uploads. Supports uploading different file types to the same upload field. You can see the document preview in both detail and edit views. Works great with multiple documents. Each document will have its own controls for scrolling, etc. The user can see and work with different documents such as a pdf, images, a text document, or a drawing space by simply moving the cursor from one space to another. There is an Abort button next to upload image field, which you can use to stop uploading if you accidentally started uploading the wrong file. It's easy to remove a file that is not needed anymore by simply clicking on the cross button which you can see corresponding to each image. The files/images in Edit View contains a Radio button which helps to determine which image to display in the Detail View. A link will then display next to it so that you can view all other files/images that are uploaded to that field. Works great with any module you choose and hence the Documents Field can be added and adjusted to various layouts such as Edit View, List View, Detail View Dashlet View, Quick Create etc. Make any document the default document. When a document is uploading, If we need to cancel it there is an abort option in a document data type for deleting uploaded document or images just click on the cross on a document. Ideadunes Software Services is the flagship of Ideadunes. It provides technology solutions in the domain of Software Services, Product Development, Infrastructure Management, Cloud Computing, Managed Hosting using the robust and scalable Amazon Web Services Platform. We provide Implementation solutions to enterprises worldwide.Ideadunes have a team with ranging experience from 1-35 years in business planning, consultancy, marketing, CRM & ERP Systems. At Ideadunes we believe in client satisfaction for which we are using an internal system for providing regular updates to our clients on daily, weekly and monthly basis, time tracking, repository management, project management, invoicing, reporting, keeping everything documented for the work done in order to keep a track of client’s requirements which helps us to move in right direction and it will assist us in getting inputs from clients to better serve them.